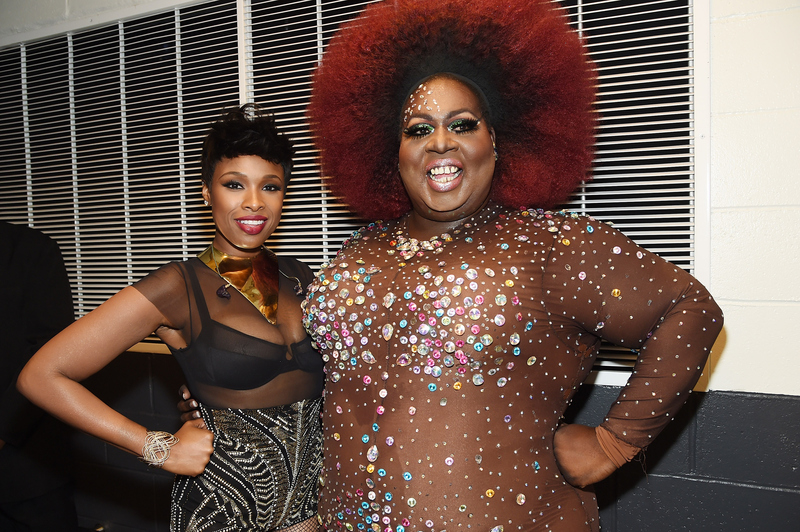 When I first heard the rumors that Miley Cyrus was going to have past contestants from RuPaul's Drag Race featured in her VMA performance, I frantically began looking for evidence that one plus size drag queen in particular would be there: Latrice Royale. It wasn't until MTV finally revealed the full list of performers that it was sadly confirmed that the body positive icon would not be a part of the now controversial performance. IMO, the body positive community could've used a representative like Royale at the VMAs. Royale has used her platform to empower people to celebrate their bodies and tell the haters to "eat it," not to mention her voice as an activist as well. She is set to appear in the documentary Gays in Prison as the host, narrator, and interviewer, exploring the lives of gay and transgender individuals in and out of prison. Although there are always a few plus size queens on each season of RuPaul's Drag Race, Royale stood out by celebrating her size rather than using it as an excuse for why she couldn't measure up to the smaller queens. Both on the show and off, she is a representative for body positivity and self love. Here are just nine times she proved as much. During Latrice Royale's time on Season 4 of RuPaul's Drag Race back in 2012, Royale blessed us with so many empowering phrases. Who could forget, "Let me explain to you what a b*tch is: being in total control of herself," and, "She is large, in charge. Chunky, yet funky. The bold and the beautiful. I am Latrice Royale." Royale's positive attitude and self confidence were truly contagious. When Royale was eliminated from RuPaul's Drag Race, she humbly and tearfully told RuPaul, "You have changed my life forever. You have changed the world of drag forever. I love you and respect you so much, and thank you for seeing something special in me," before making an exit speech in which she told everyone to be the best that they can be. How often do you empowering messages like this coming from a size inclusive place on one of TV's biggest shows? The answer is: Not often. When Royale was crowned Miss Congeniality at the Season 4 finale of RuPaul's Drag Race, I don't think anyone was surprised. But when it came to her acceptance speech, her fans (including myself) found another reason to love her. Royale said, "I want people to realize it's OK to make mistakes, it's OK to fall down. Get up, look sickening, and make them eat it!" The message that it's simply "OK" to make mistakes was so important to my own self love journey, and I often call upon these words when I am feeling in need of inspiration. I can't tell you the number of times I've tried to buy a T-shirt, only to see that the brand didn't carry anything beyond a size L or XL. Well, Mother Latrice has us all covered. Her merchandise is totally size inclusive, with most tees ranging from sizes S to 5X! Tees have famous Royale sayings on them, such as "Chunky Yet Funky" and "Large and in Charge." I've seen so many amazing body positive images lately of fat babes doing yoga, but let me just add Latrice Royale's epic split in a bodysuit covered in chains to the fat-babes-can-do-anything-list of powerful images. If the expression on her face in this photo doesn't send a message to the haters, I don't know what could. In 2014, Royale performed alongside Jennifer Hudson on Fashion Rocks and wore a sheer bodysuit encrusted with rhinestones and jewels. The bodysuit was even reminiscent of Britney Spears' famous 2000 VMA look. To see a person of size wearing something similar and on national television with no apologies was a big deal. For many Millennials, Ursula was one of the first negative images that we were shown of plus size women in the media, and anytime that a fat babe can reclaim that kind of imagery as something empowering is undoubtedly inspiring. When it comes to Royale's rendition, the look is pretty epic. Never one to she away from a little sparkle, Royale's face was covered in jewels. She even wore the look in the Miami Beach Gay Pride Parade. Talking about weight loss in the body positive community can be tricky and when I saw this photo posted on Royale's Facebook page showing off his new pair of shorts, I was struck more by the caption in which said he says he doesn't own a scale. With so much of our society being obsessed with weight and diet culture, Royale's message is a subtle but strong clap-back to a world that tells us that our happiness should be determined by a number on the scale. Since at least 68 weeks ago, Latrice Royale has been officiating weddings and doing so in the most epic of gowns. I cannot imagine anyone to better inject some positivity into your wedding than Ms. Royale herself. Here's hoping for a Drag Race spinoff. This queen needs her own show.